The medieval fishing village of Tossa de Mar, 56 miles (90km) north of Barcelona, is the most attractive town on the Costa Brava, offering lovely sandy beaches and a lively atmosphere. Once the main port for exporting cork, Tossa is now dependent on tourism. Visitors are drawn to its 12th century walled town, Vila Vella, the ancient walls, battlements and towers enclosing a quaint historical labyrinth. There is also the ancient Castillo de Tossa de Mar, a one-time Roman fortress dominating the bay, which visitors are free to explore. 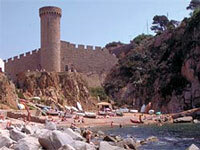 There are four beaches within the town itself and numerous others flanking Tossa on either side. It is easy to get around town on foot, but there is a blue and white tourist train that offers tours of the town, and a green train that takes visitors up to the fort. It is possible to walk up to the fort but don't try driving yourself up as the roads get very narrow and there is no parking at the top. There are, however, wonderful views and photo opportunities, and a visit to the fort is worthwhile for this alone. There are diving shops and centres in town to provide equipment, advice and companionship for scuba expeditions, and glass-bottomed boat tours and snorkelling are also popular.